Bellbrook sophomore Bailey Sedlak (23) scored two of the Golden Eagles’ goals in the 4-0 Sept. 26 win over visiting Franklin. Cassi Hennen drives down the field in the first half of Tuesday’s girls high school soccer match at Bellbrook High. Hennen scored a goal in Bellbrook’s 4-0 home win over Franklin. Bellbrook senior goalie Bekah Vine bumps with Chloe Crompton during pre-game introductions Sept. 26 in Bellbrook. Vine and teammate Claire Baker have registered nine shutouts in 10 matches so far this season. Bellbrook senior Gabby Gerbic steals the ball from a Franklin player and heads up field, as Golden Eagles teammate Molly Spears trails the play. 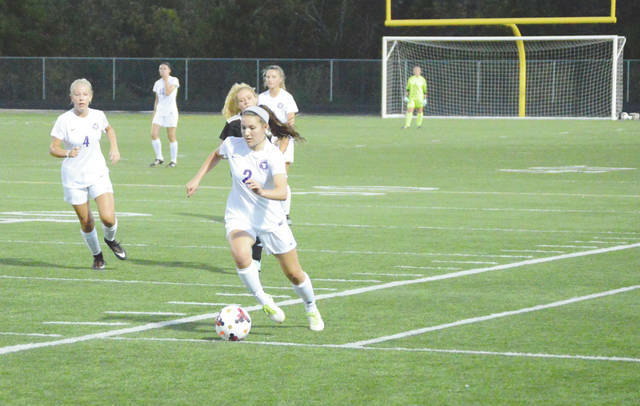 Gerbic scored an assist in the Sept. 26 win at Bellbrook High. 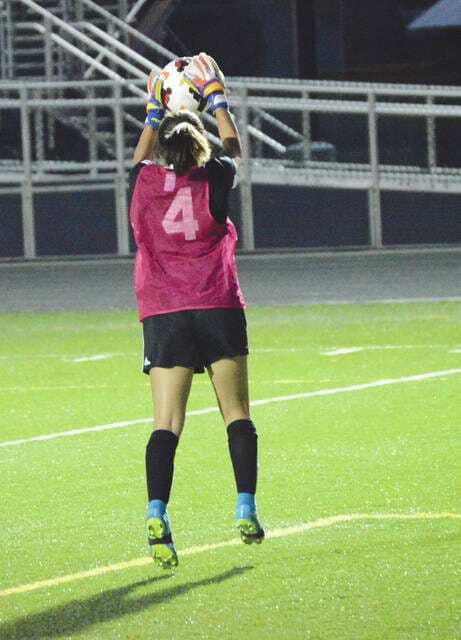 Franklin goalie Katy Trevino makes a stop, during the first half of a Sept. 26 Southwestern Buckeye League, Southwestern Division match at Bellbrook High School. Host Bellbrook won the match, 4-0. 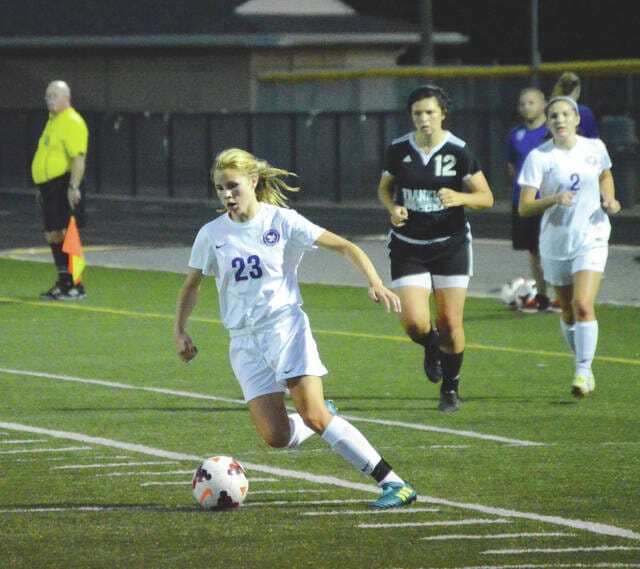 BELLBROOK — A stingy defense, persistent offense and plenty of game-time experience has the Bellbrook High School girls soccer team flying undefeated so far this season. The veteran team regrouped from a close first half to defeat visiting Franklin by a 4-0 score, Sept. 26 at Bellbrook High. Sophomore Bailey Sedlak scored the game’s only score of the first half. With not quite a minute having ticked off the game clock, Sedlak drove behind the Wildcats defense to get off a score from close range. Despite six Bellbrook corner kick opportunities in the opening half, Sedlak’s score was the only points in the opening 40 minutes of play. After five more Bellbrook corner kick tries to start the second half, the Golden Eagles (9-0-1, 7-0-1 in the Southwestern Buckeye League’s Southwestern Division) got on the board again with 27:43 left in the match. Senior Gabby Gerbic drove to her left, fired a nice crossing pass to the right, where junior Cassi Hennen was there to knock in the score from close in. About four minutes later, Sedlak got her second score of the match, another unassisted score from close in and off to the right of the goal. With 18:47 left in the contest, Jade Edwards saw a deep Bellbrook kick bounce off of a Franklin defender. The bounce was just enough to enable Edwards to slip in behind the defense, take control of the ball, and fire home a nifty left-to-right goal for the final Bellbrook tally of the night. Huffman credits the team’s success to a quartet of four-year varsity players on his roster: Bekah Vine, Molly Spears, Cassidy Bereda and Cassidy Hofacker are each four-year starters for the Golden Eagles. Back-up goalie Claire Baker earned Tuesday night’s shutout. She and Vine now have nine shutouts in 10 games thus far this season. The team has outscored opponents 32-1, with the lone goal coming in a 3-1 win over Germantown Valley View back on Sept. 5. With her two goals in Tuesday’s win, Sedlak is now the team’s scoring leader with 10 goals and three assists. Spirk is next with nine goals and three assists. Both rank among the SWBL’s top-10 scorers. 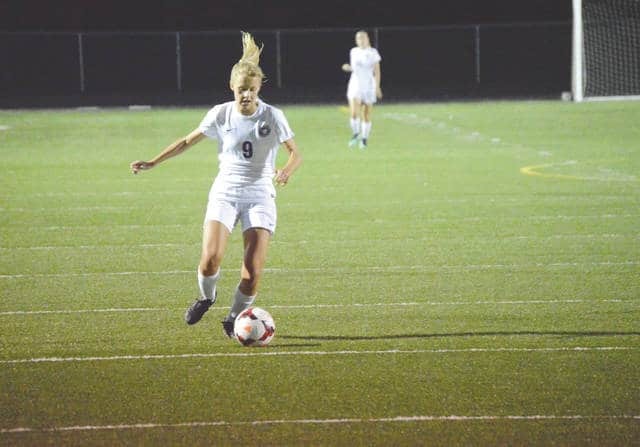 Despite its undefeated record, Bellbrook is not ranked among the top 10 Division II girls teams in the state by the Ohio Scholastic Soccer Coaches Association just yet. The Golden Eagles are one of seven schools outside the top 10 to receive votes, however. The Eagles claimed a district title last season, before losing to Cincinnati McNicholas in the regional semifinal round. Bellbrook will get a regular season taste of postseason play Saturday, Sept. 30, when they’ll face the state’s No. 1 Division II team — defending state champion Kettering Alter — in the team’s next contest. That game is set for a 2 p.m. start in Kettering. The junior varsity match is set for a noon start.